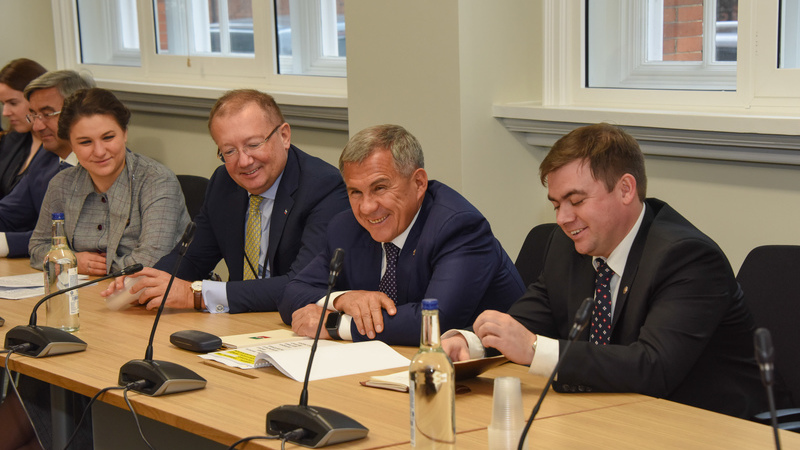 The Head of Tatarstan Investment Development Agency Taliya Minullina paid a two-day working visit to London as a part of Tatarstan’s delegation headed by the President of the Republic of Tatarstan Rustam Minnikhanov. First persons of Tatarstan took part in the Fourth Russian-British Business Forum and held a number of business meetings. At the forum, representatives of authorities, international, British and Russian political elite, heads of companies, business owners and representatives of various sectors of economy, heads of public organizations, associations and development institutions assessed the dynamics of market development and international trade relations, identified trends in the economy and interests of investors, worked out the ways of expanding trade and economic cooperation. The Forum was organized by the Trade Delegation of the Russian Federation in the United Kingdom with the support of Russian authorities involved in foreign trade, the Embassy of the Russian Federation in the UK, the Roscongress foundation, as well as over 30 Russian and International partners. This year the forum is dedicated to promotion of high-tech export, digitalization of economy and expansion of trade in services. His Royal Highness Prince Michael of Kent, the Member of the British royal family, the Patron of the Russo-Britain Chamber of Commerce took part in the opening ceremony. During the working visit of the delegation, the meetings with the representatives of the British Parliament and business community were held. First Minister of Wales Carwyn Jones commended the achievements of Tatarstan in the field of economy and industrial development and supported the proposal of the President of Tatarstan Rustam Minnikhanov to establish a working group for the analysis of promising areas for cooperation. "The Great Britain and the Republic of Tatarstan have great potential for the development of external economic relations. On results of 2017, the trade turnover increased by 55%, amounting to 340 million dollars. According to the results of 9 month of the current year, there is a positive momentum: the volume of mutual trade exceeded $800 million. Today, in an open dialogue with the British government and business community, we intend to strengthen our cooperation by opening new markets and attracting new investors", - Taliya minullina commented. At the Forum, the ceremony of signing a cooperation agreement between the Tatarstan company "AGROSILA" and the British Company "Househam" took place. "Househam" is a leading manufacturer of self-propelled, trailed and mounted sprayers in the UK. "AGROSILA" is an agricultural holding, including 25 agricultural enterprises for the cultivation, reception, storage and processing of grain and industrial crops, production of livestock and poultry products, sugar production, as well as the sale of manufactured goods and maintenance of agricultural machinery. The purchase of "Househam" equipment will increase the efficiency of field processing, improve the quality and volume of the harvested crop. The agreement envisages the establishment of the official representative office in Naberezhnye Chelny, aimed at maintaining and selling of "Househam" equipment.